Just a quick note to let you know things are progressing in the kitchen. Despite being laid up with my back for 2 days, then another 2 days with some stomach bug, I’ve managed to do all the painting – walls, door and window frames, skirting boards. Yesterday afternoon Handyman brought over the kitchen bench. Today he’s fitting it. Easier said than done as there’s that nasty 45 degree angle to contend with. Lucky it was Wayne who insisted it be done that way so I don’t have to feel guilty when I see how had it is to get just right. 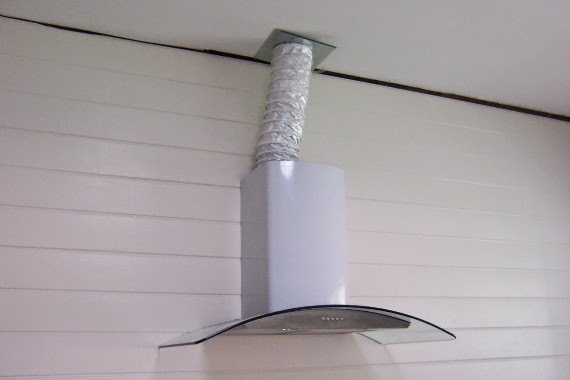 The other day he put the rangehood up and we discovered that when they sell these things they don’t give you nearly enough stainless steel cover for the vent… you have to buy more! Seriously, we have a low ceiling in the kitchen and it was about 2 inches short of being safe and steady! Wayne has made a ‘plinth’ for it to sit on on the ceiling. Looks very art deco. I’m painting that today so the job can be finished. 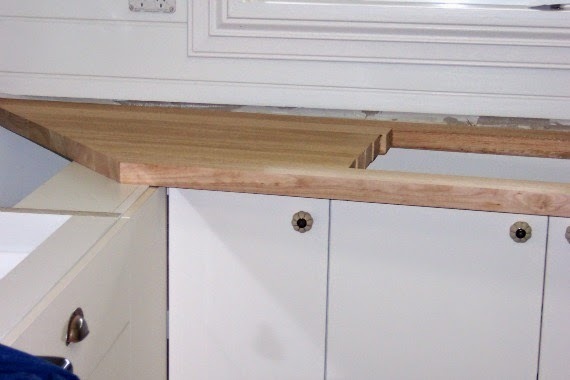 This entry was posted in DIY, kitchen makeover, Renovating by zefiart. Bookmark the permalink. Wow!!! All the work, all the stress, all the waiting for the trades-it is starting to look downright gorgeous!!! !